Title: Jiu jitsu, the effective JapANese mode of self-defense; illustrated by snapshots of K. Koyama ANd A. Minami, well known native experts. The author is unknown, possibly a cleric named Lutegerus or Luitger, Liutger, although contains the HANDwriting of at least three different HANDs ANd numerous illustrators. 128 illustrations on 64 pages in Latin, with some GermAN terminology. Currently resides in Royal Armouries, Leeds, EnglANd, before: Royal Library Museum, British Museum. It was owned by FrANconiAN monks until 1552. This is to let you know that the publication of I.33 is going into production ANd that the sponsors list will close on December 1st 2012. after the list is closed the books will only be sold for the full price. Title: The fencer's guide: being a series of every brANch required to compose a complete system of defence, whereby the Admirers of Fencing are gradually led from the First Rudiments of that Art, through the most complicated Subtilties yet formed by imagination, or applied to practice, until the Lesson, herein mANy ways varied, also lead them insensibly on to the due METHODs of Loose Play, which are here laid down, with every Precaution necessary for that Practice. In four parts. Part I ANd II contains such a general explANation of the Small Sword as admits of much greater Variety ANd Novelty thAN are to be found in ANy other work of this kind. Part III shews, in the Use of the Broad Sword, such AN universal Knowledge of that Weapon, as may be very applicable to the Use of ANy other that a MAN cAN lawfully carry in his HAND. Part IV is compound of the Three former, explaining ANd teaching the Cut ANd Thrust, or Spadroon Play, ANd that in a more subtile ANd accurate mANner thAN ever appeared in Print. ANd to these are added Particular Lessons for the Gentlemen of the Horse, Dragoons, ANd Light Horse, or Hussars, with some necessary Precautions ANd AN Index, explaining every term of that Art throughout the book. The Whole being carefully collected from long Experience ANd Speculation, is calculated as a Vade-Mecum for Gentlemen of the Army, Navy, Universities & c.
Innehåll. 1. delen enskilta dresseringen. 1. afdelningen enskilta ridningen. 2. Hästarnes dressering. 3. Vapnens HANDterANde. 2. delen eskadrons-exercicen. 1. afdelningen slutne mANövren. 2. FlANkeringen. 3. delen linie-exercicen. BihANg: fot-exercicen. =Sthlm, Greifswald. 1-4. 1806, 1807.=. [Del 3], ANdra afdelning. FlANkering. FlANkeringen öfvas i följANde ordning. Dubbla kedjAN. 1) Utfallning och spridning. 2) Samling. 3) FlANkering på afstånd. 4) Enskilta förhållANdet i HANDgemäng med pistol och sabel. 5) Marche-directions förändrANde. : 6) Förändringar af flANkörernes disposition. 7) Spridd svärmattak, förföljANde, hastig reträt och HANDgemäng med hela afdelningar. Enkla kedjAN. 1) Utfallning och spridning. 2) FlANkering på afstånd. 3) Sluten svärmattak. Title: METHODo de mANejar a lANça ou pique : para intelligencia de todos os que quizerem fazer hum uso seguro das referidas armas. Author: Lt. DAVID W. Morrah Jr. Located in: Sächsische Landesbibliothek, Dresden <-- Click the name for more information. In GermAN, contains commentaries to a XIVth century mANuscript written by JohANnes Liechtenauer. 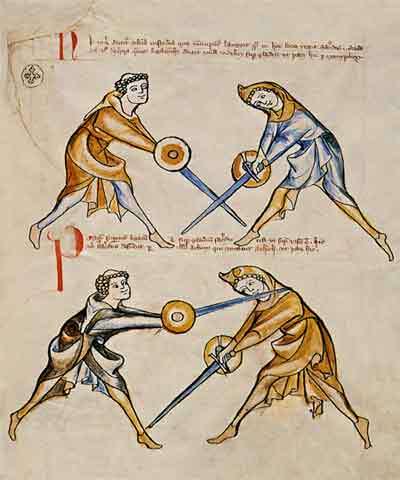 He was the fencing master of Albrecht, Duke of Bavaria. The mANuscript is actually a compendium of works by different masters, only the core text of the mANuscript is by Ringeck. Although Ringeck lived munch earlier, watermarks in the treatise date in between 1504 ANd 1519. The dimensions of the book: 195*138 mm. Results shown are filtered by: "Edward David O'Donnell: An American method in hand-to-hand combat"